If “extended column test,” “shear strength,” and “propagation” are all in your daily vocabulary then we invite you to keep reading. The Snow Crystal Card is the largest and most feature-packed snow card in the Brooks Range family. 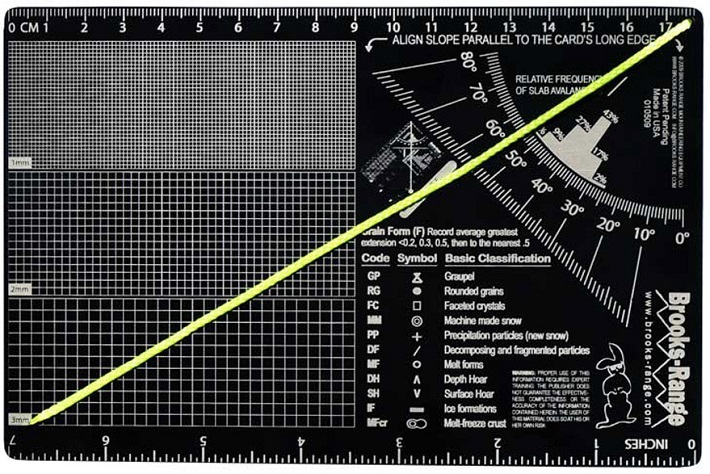 A built-in inclinometer helps you calculate avalanche danger in the winter and prove to your friends that it really was as steep as you thought in the spring. Laser etched to perfection, the Snow Crystal Card features just about everything you could want. Featuring 1mm, 2mm, and 3mm textured grids, metric rulers, crystal grain chart, and instructions for rutschblock and stuffblock tests. 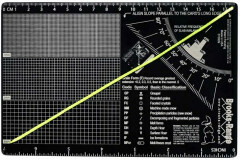 What sets this apart is the inch ruler and instructions for both the stuffblock and shovel shear test. If you like geeking out about snow, this is the place to start.